The Ameri-Lite 199RK – There’s simply NOTHING else like it! 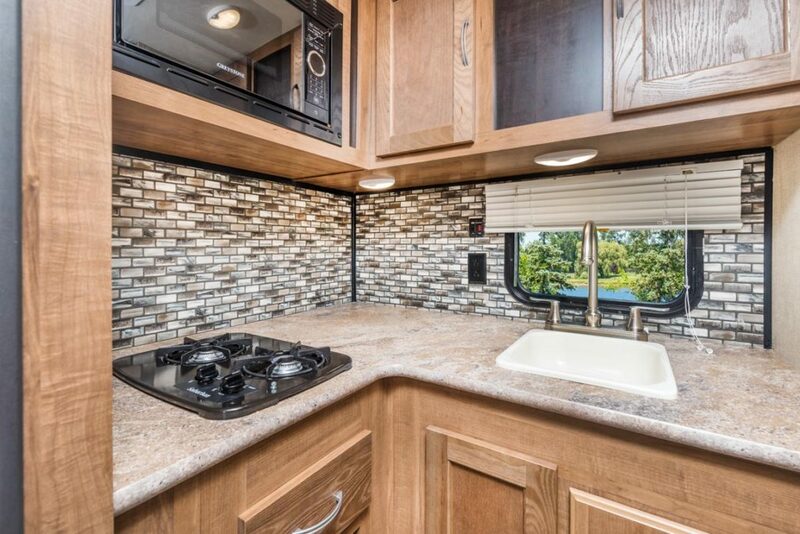 The people of Gulf Stream Coach are experts at building lightweight, economical, and incredibly functional small travel trailers, having introduced the industry-standard Ameri-Lite line over 15 years ago. 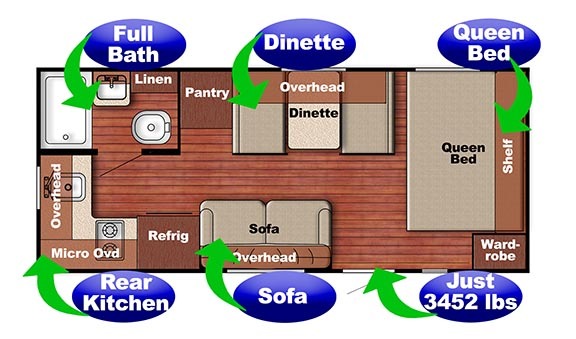 It’s quite possible that more people have discovered the joy of travel trailer camping in an Ameri-Lite than in any other RV brand. That’s why the introduction of the 199RK should be no surprise. Over the years, we’ve perfected the art and science of designing economical, useful trailers, and the Ameri-Lite 199RK is the result of that design experience. AND – It’s the only one of its kind! The single-axle design means the Ameri-Lite 199RK tows easily and maneuvers predictably. The light-weight formula keeps the overall base weight of the 199RK under 3,500 lbs., with over 1,400 lbs. of carrying capacity. The kitchen is a true miracle of design, with two-burner cooktop, microwave oven, sink, and oversized refrigerator/freezer. The bath includes a tub/shower with skylight and power vent, a washstand, medicine cabinet, and foot-flush toilet. Storage is everywhere – including overhead cabinets above the Dinette and Sofa, a large pantry across from the fridge, a storage shelf and closet in the master bed area. There’s under-seat and under-bed storage, and a handy basement with an exterior door. If you’re in the market for a small, lightweight travel trailer, what is on your list of “needs and wants”? 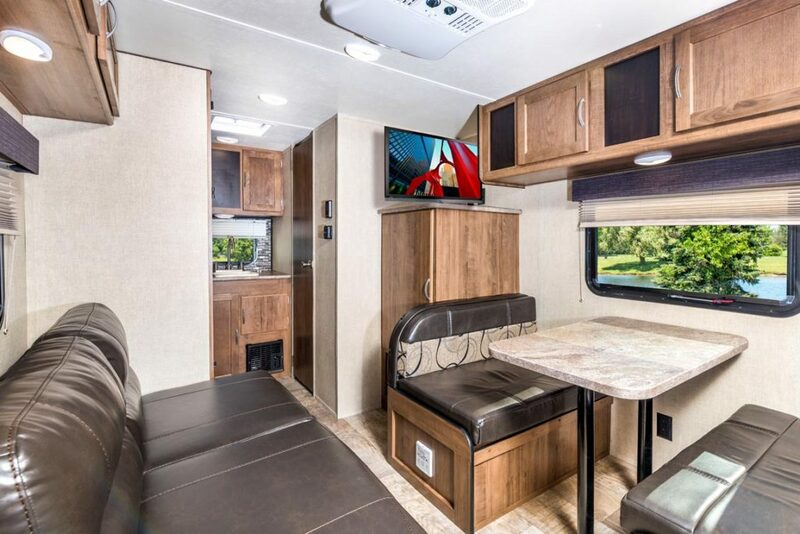 It likely includes all of the items listed above – and if it does, the Ameri-Lite 199RK is PERFECT for you. AND there’s no reason to look further, because there’s simply nothing else like it! This entry was posted in News on January 30, 2018 by pcampbell@gulfstreamcoach.com.